Gambia’s government has executed nine prisoners by firing squad on Sunday which has sparked international condemnation. Reports say nine death row prisoners had been executed by firing squad, including one woman after they were sentenced to death and all their appeals were denied. The execution reportedly took place after the Gambian President Yahya Jammeh promised to carry out all death sentences by mid-September. Today, an independent United Nations human rights expert has expressed strong condemnation on the recent execution of nine people in Gambia. UN Special Rapporteur on extrajudicial, summary or arbitrary executions, Christ Heyns called on the Government to refrain from executing an additional 39 people reported to be on death row. Mr. Heyns cites that according to available evidence the trials did not meet due process safeguards. In addition, the United States of America today expressed deep concern by the Government of The Gambia’s execution of nine death row inmates. Department Spokesperson Victoria Nuland says the US government condemns the lack of transparency. Ms. Nuland says the United States calls on the Government of Gambia to ensure that its own internal laws are respected and followed, and to uphold its international obligations under the International Convention on Civil and Political Rights and the United Nations Universal Declaration of Human Rights. 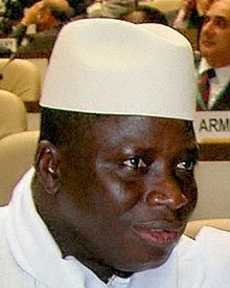 Reports say that in Gambia, capital punishment can be imposed for murder and treason. Three of the reportedly executed have been guilty for treason. Reports say there were 42 men and two women on death row as of 31 December 2011. This year, three men have reportedly also received the death sentence, making a total of 47 people currently on death row.